Gail V is our first official participant in our “Online Halloween Mask Party” – and what a nice way to get started! 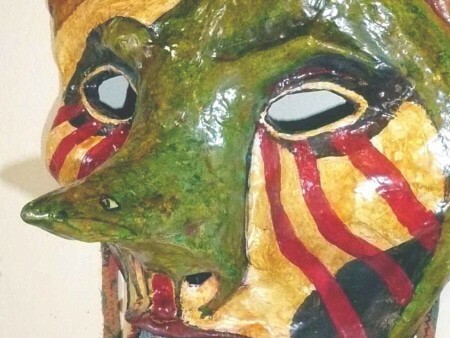 According to her website, these are the first two paper mache masks Gail has ever made. I hope she makes some more, because these are really inventive. (Be sure that you also check out her dolls). 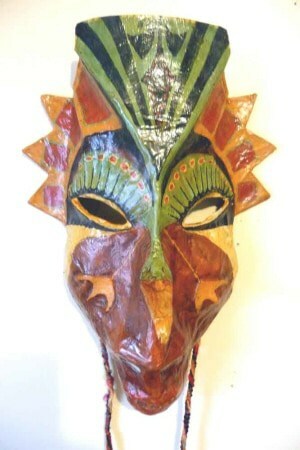 Here’re some pics of a paper mache mask I just finished. Made using newspaper strip paper mache and acrylic paints. 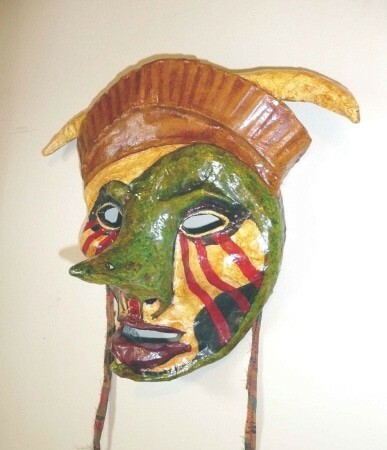 It’s a full adult-sized mask that can be hung on the wall or worn. Happy Halloween! 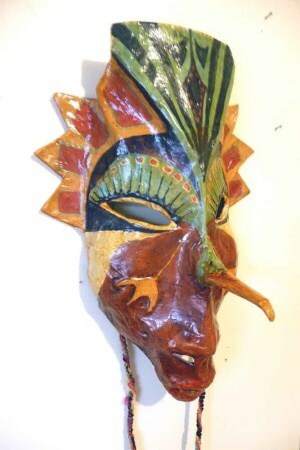 Here’re some pics of my 2nd paper mache mask. Made using newspaper strip paper mache and acrylic paints. 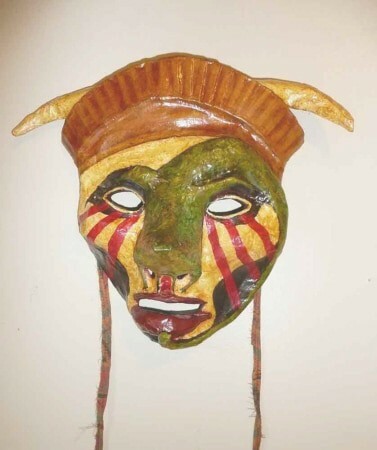 It’s a full adult-sized mask that can be hung on the wall or worn. Love your blog and your new paper mache clay recipe. Thanks for sharing. 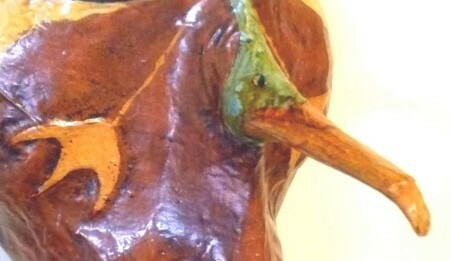 I hope lots of readers are busy getting their Halloween masks ready to show here on the UltimatePaperMache.com blog. You can show off your own Halloween masks (or any other Halloween item – no rules!) on your very own guest post, like this one. To see how, click this link. WOW!!! It took me a few minutes to register what I was seeing! How totally original!!! Great job! When I see the talent that is out there, I get jealous and inspired at the same time. These masks are really a work of art. I love the idea of juxtaposition of birds and human face. I would have never thought of that. These are a great start to what will no doubt be a lot of fun for all. I love your old woman mask, too, Jonni! I want to participate in this event so much. I just started a new semester in college, though, and am already swamped with homework, but I will try. If nothing else I can drool over what everyone else has accomplished!! Hi Ann – it’s nice to hear from you again. How many more semesters until you’re finished with school? By the way, I think you were one of the folks who participated in our “intentional community” discussions. I’ve started a new on on my gardening blog (which has about two visitors a day, but it seemed like a better spot for it). It’s a weird philosophical discussion, which is why I think it’s interesting. 😉 If you or anyone else would like to join in, you can find the “finding the right stories for building a new community” post here. Thanks for posting my masks, Jonni. I’m working on another mask now. And I’m working on a doll using your new pm clay. It’s a great clay!